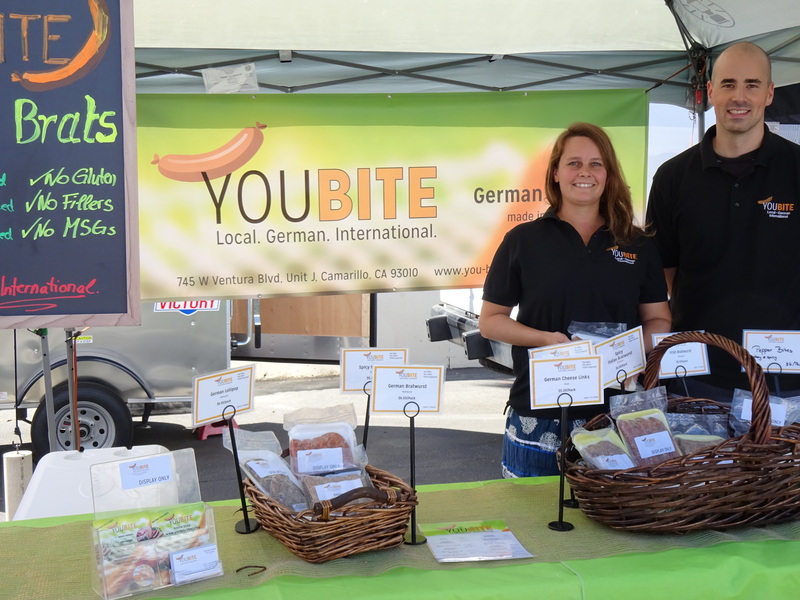 David and Carina, our main sausage makers, represent YOUBITE at Farmers Markets in Ventura and LA County. At which Farmers Markets do we sell? Come check out this small but nice and cozy weekday Farmers Market located at the Pacific View Mall. Come check out this afternoon Farmers Market located at the popular Oaks Shopping Center. This is where we started our Farmers Markets experience in April 2016. The market can be found in the heart of Oldtown Camarillo and offers fresh vegetables, fruits, eggs, bread and of course our sausages. It’s from 8am-noon, rain or shine at 2220 Ventura Boulevard, Old Town Camarillo. Check out their website here. This is one of the prettiest Farmers Markets we have been to. It’s very busy and the decoration is beautiful. Come by and take a stroll through this beautifully meandering Farmers Market in the heart of Calabasas. A great farmers market with a lot of vendors, meaning a great variety of fresh produce, baked goods, kettle corn and food. This is one of the bigger Farmers Markets in Ventura County. There’s everything from arts and crafts to produce and delicious food. It’s next to the ocean so you can pick up your sausages right after a visit to the beach. Check out beautiful Farmers Market at “The Village”. There is always fresh produce, nice vendors and of course our sausages! Grab a coffee and enjoy your grocery shopping on a lovely Sunday morning. Very busy Farmers Market with lots and lots of vendors. This one is probably the busiest of our markets and there is a lot of produce, crafts and foods. Definitely worth checking out. Lots of varieties on this Farmers Market by the college in Santa Clarita. It’s a little earlier than the other markets because it can get quite toasty in Santa Clarita in the afternoons. So make sure you stop by and visit this lovely Farmers Markets not far from Magic Mountain! What do we sell at the Farmers Markets? At the Farmers Markets we sell our bestsellers like the German or Spicy Bratwurst, our Nurnbergs and Wieners but also seasonal or specialty sausages. This includes a Paprika Bologna with fresh red bell peppers, Leberkaese, Lamb sausage and breakfast sausages of different kinds. Do you have any tips for shopping at the Farmers Markets? Sure we do. First of all, be prepared to try new things. All the people at the Farmers Market have their own businesses so it’s a very diverse representation of what is going on in that town or county. There will be lots of interesting products to check out. There will be lots of interesting people to talk to. Some markets even offer entertainment like a band playing songs. Definitely take your time to stroll around the market and see all the vendors and their products. It will be worth your time. Be prepared to actually taste some of the samples vendor offer you. Once you have tried the product, the decision will be an easy one. The quality on a Farmers Market is at least above average. The freshness of the products can not be beaten and don’t forget that you have the chance to support local businesses from your area. Also, make sure to bring your own bag for your shopping. At the markets we try to be as ‘green’ as possible and so we can save on the plastic or paper. We do offer plastic bags when asked but we prefer when people bring their own bags.